Winter is far from over in Kalispell, which is why Grachek Insurance wants to help area residents prevent ice dams from forming on their roofs. Ice dams are a major cause of roof leaks in the winter, and they result in thousands of homeowner’s insurance claims each year. Fortunately, there are preventive measures you can take now and in the warmer months to safeguard your roof from leaks. Ice dams are large chunks of ice that form around the perimeter of your roof. They typically start as a result of poor roof drainage, and worsen as melting snow fails to drain off the roof. Instead, that water seeps underneath the shingles, where it can cause the most damage. While warm, sunny days in winter are a potential cause of ice dams and subsequent roof leaks, a warm roof is also to blame. If your roof is hot in some spots but cold around the perimeter, the snow will melt but be stopped by the ice that has formed along the edges. The best way to avoid ice dams is by keeping the entirety of your roof cold. You can do this by sealing off cracks and gaps in your ceiling that may be allowing warm air to escape to the attic. If your attic is poorly insulated, consider adding more. Blown-in insulation is usually a better choice, as it leaves fewer gaps around rafters. Make sure your attic is well ventilated, too; add roof and soffit vents if needed. Not only will this keep your roof cold, but it can also reduce your heating costs. Adding more insulation and soffit vents isn’t always an option, particularly in the thick of winter. If that’s the case, there are some steps you can take now to prevent ice dams. 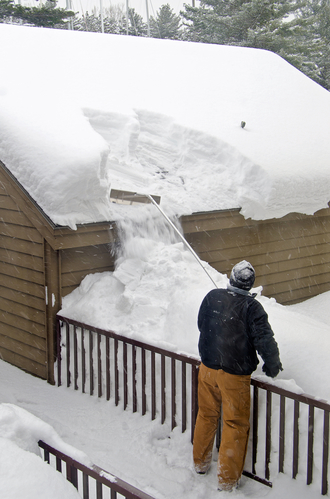 Using a snow rake on single-story homes to remove snow before it can melt is a good option. However, be careful to avoid damaging your roof shingles. By following the tips above, you can avoid roof leaks and avoid having to make a homeowner’s insurance claim for a new roof. If you already have ice dams, keep an eye out for signs of leaks and call your insurance company and a roofing contractor right away. If you aren’t sure what your homeowner’s insurance policy covers, the agents at Grachek Insurance are here to answer your questions. They also offer a range of other products to meet your needs, including auto and life insurance. Visit them online or call (406) 755-4000 to request a quote or speak with an agent.